…people who lack the knowledge or wisdom to perform well are often unaware of this fact. We attribute this lack of awareness to a deficit in metacognitive skill. That is, the same incompetence that leads them to make wrong choices also deprives them of the savvy necessary to recognize competence, be it their own or anyone else’s. As you can see, the findings reported by Kruger and Dunning are often interpreted to suggest that the less competent people are, the more competent they think they are. People who perform worst at a task tend to think they’re god’s gift to said task, and the people who can actually do said task often display excessive modesty. I suspect we find this sort of explanation compelling because it appeals to our implicit just-world theories: we’d like to believe that people who obnoxiously proclaim their excellence at X, Y, and Z must really not be so very good at X, Y, and Z at all, and must be (over)compensating for some actual deficiency; it’s much less pleasant to imagine that people who go around shoving their (alleged) superiority in our faces might really be better than us at what they do. That said, it’s clear that there is a very large discrepancy between the way incompetent people actually perform and the way they perceive their own performance level, whereas the discrepancy is much smaller for highly competent individuals. So the big question is why. Kruger and Dunning’s explanation, as I mentioned above, is that incompetent people lack the skills they’d need in order to know they’re incompetent. For example, if you’re not very good at learning languages, it might be hard for you to tell that you’re not very good, because the very skills that you’d need in order to distinguish someone who’s good from someone who’s not are the ones you lack. If you can’t hear the distinction between two different phonemes, how could you ever know who has native-like pronunciation ability and who doesn’t? If you don’t understand very many words in another language, how can you evaluate the size of your own vocabulary in relation to other people’s? 1. Regression toward the mean. Probably the most common criticism of the Dunning-Kruger effect is that it simply reflects regression to the mean–that is, it’s a statistical artifact. Regression to the mean refers to the fact that any time you select a group of individuals based on some criterion, and then measure the standing of those individuals on some other dimension, performance levels will tend to shift (or regress) toward the mean level. It’s a notoriously underappreciated problem, and probably explains many, many phenomena that people have tried to interpret substantively. For instance, in placebo-controlled clinical trials of SSRIs, depressed people tend to get better in both the drug and placebo conditions. Some of this is undoubtedly due to the placebo effect, but much of it is probably also due to what’s often referred to as “natural history”. Depression, like most things, tends to be cyclical: people get better or worse better over time, often for no apparent rhyme or reason. But since people tend to seek help (and sign up for drug trials) primarily when they’re doing particularly badly, it follows that most people would get better to some extent even without any treatment. That’s regression to the mean (the Wikipedia entry has other nice examples–for example, the famous Sports Illustrated Cover Jinx). In the context of the Dunning-Kruger effect, the argument is that incompetent people simply regress toward the mean when you ask them to evaluate their own performance. Since perceived performance is influenced not only by actual performance, but also by many other factors (e.g., one’s personality, meta-cognitive ability, measurement error, etc. ), it follows that, on average, people with extreme levels of actual performance won’t be quite as extreme in terms of their perception of their performance. 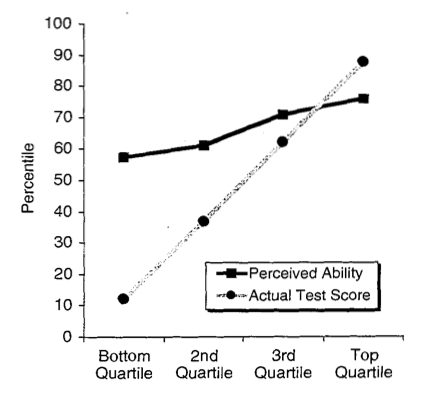 So, much of the Dunning-Kruger effect arguably doesn’t need to be explained at all, and in fact, it would be quite surprising if you didn’t see a pattern of results that looks at least somewhat like the figure above. 2. Regression to the mean plus better-than-average. Having said that, it’s clear that regression to the mean can’t explain everything about the Dunning-Kruger effect. One problem is that it doesn’t explain why the effect is greater at the low end than at the high end. That is, incompetent people tend to overestimate their performance to a much greater extent than competent people underestimate their performance. This asymmetry can’t be explained solely by regression to the mean. It can, however, be explained by a combination of RTM and a “better-than-average” (or self-enhancement) heuristic which says that, in general, most people have a tendency to view themselves excessively positively. This two-pronged explanation was proposed by Krueger and Mueller in a 2002 study (note that Krueger and Kruger are different people! ), who argued that poor performers suffer from a double whammy: not only do their perceptions of their own performance regress toward the mean, but those perceptions are also further inflated by the self-enhancement bias. In contrast, for high performers, these two effects largely balance each other out: regression to the mean causes high performers to underestimate their performance, but to some extent that underestimation is offset by the self-enhancement bias. As a result, it looks as though high performers make more accurate judgments than low performers, when in reality the high performers are just lucky to be where they are in the distribution. Notice that this finding wasn’t anomalous with respect to the Kruger and Dunning findings; when participants were given easier trivia (the diamond-studded line), Burson et al observed the standard pattern, with poor performers seemingly showing worse calibration. Simply knocking about 10% off the accuracy rate on the trivia questions was enough to induce a large shift in the relative mismatch between perceptions of ability and actual ability. Burson et al then went on to replicate this pattern in two additional studies involving a number of different judgments and tasks, so this result isn’t specific to trivia questions. In fact, in the later studies, Burson et al showed that when the task was really difficult, poor performers were actually considerably better calibrated than high performers. Looking at the figure above, it’s not hard to see why this would be. Since the slope of the line tends to be pretty constant in these types of experiments, any change in mean performance levels (i.e., a shift in intercept on the y-axis) will necessarily result in a larger difference between actual and perceived performance at the high end. Conversely, if you raise the line, you maximize the difference between actual and perceived performance at the lower end. To get an intuitive sense of what’s happening here, just think of it this way: if you’re performing a very difficult task, you’re probably going to find the experience subjectively demanding even if you’re at the high end relative to other people. Since people’s judgments about their own relative standing depends to a substantial extent on their subjective perception of their own performance (i.e., you use your sense of how easy a task was as a proxy of how good you must be at it), high performers are going to end up systematically underestimating how well they did. When a task is difficult, most people assume they must have done relatively poorly compared to other people. 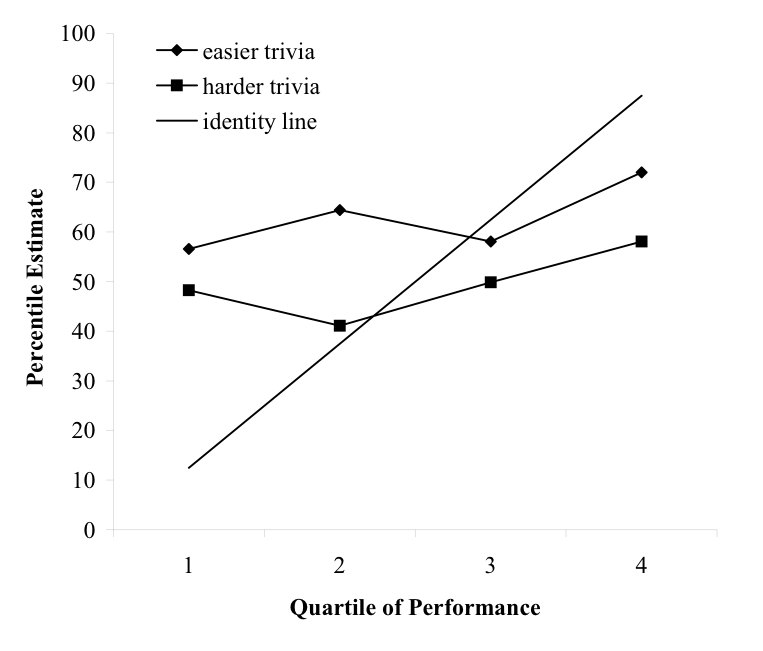 Conversely, when a task is relatively easy (and the tasks Dunning and Kruger studied were on the easier side), most people assume they must be pretty good compared to others. As a result, it’s going to look like the people who perform well are well-calibrated when the task is easy and poorly-calibrated when the task is difficult; less competent people are going to show exactly the opposite pattern. And note that this doesn’t require us to assume any relationship between actual performance and perceived performance. You would expect to get the Dunning-Kruger effect for easy tasks even if there was exactly zero correlation between how good people actually are at something and how good they think they are. Our studies replicate, eliminate, or reverse the association between task performance and judgment accuracy reported by Kruger and Dunning (1999) as a function of task difficulty. On easy tasks, where there is a positive bias, the best performers are also the most accurate in estimating their standing, but on difficult tasks, where there is a negative bias, the worst performers are the most accurate. This pattern is consistent with a combination of noisy estimates and overall bias, with no need to invoke differences in metacognitive abilities. In this regard, our findings support Krueger and Mueller’s (2002) reinterpretation of Kruger and Dunning’s (1999) findings. An association between task-related skills and metacognitive insight may indeed exist, and later we offer some suggestions for ways to test for it. However, our analyses indicate that the primary drivers of errors in judging relative standing are general inaccuracy and overall biases tied to task difficulty. Thus, it is important to know more about those sources of error in order to better understand and ameliorate them. What should we conclude from these (and other) studies? I think the jury’s still out to some extent, but at minimum, I think it’s clear that much of the Dunning-Kruger effect reflects either statistical artifact (regression to the mean), or much more general cognitive biases (the tendency to self-enhance and/or to use one’s subjective experience as a guide to one’s standing in relation to others). This doesn’t mean that the meta-cognitive explanation preferred by Dunning, Kruger and colleagues can’t hold in some situations; it very well may be that in some cases, and to some extent, people’s lack of skill is really what prevents them from accurately determining their standing in relation to others. But I think our default position should be to prefer the alternative explanations I’ve discussed above, because they’re (a) simpler, (b) more general (they explain lots of other phenomena), and (c) necessary (frankly, it’d be amazing if regression to the mean didn’t explain at least part of the effect!). We should also try to be aware of another very powerful cognitive bias whenever we use the Dunning-Kruger effect to explain the people or situations around us–namely, confirmation bias. If you believe that incompetent people don’t know enough to know they’re incompetent, it’s not hard to find anecdotal evidence for that; after all, we all know people who are both arrogant and not very good at what they do. But if you stop to look for it, it’s probably also not hard to find disconfirming evidence. After all, there are clearly plenty of people who are good at what they do, but not nearly as good as they think they are (i.e., they’re above average, and still totally miscalibrated in the positive direction). Just like there are plenty of people who are lousy at what they do and recognize their limitations (e.g., I don’t need to be a great runner in order to be able to tell that I’m not a great runner–I’m perfectly well aware that I have terrible endurance, precisely because I can’t finish runs that most other runners find trivial!). But the plural of anecdote is not data, and the data appear to be equivocal. Next time you’re inclined to chalk your obnoxious co-worker’s delusions of grandeur down to the Dunning-Kruger effect, consider the possibility that your co-worker’s simply a jerk–no meta-cognitive incompetence necessary. If the task is not in any way life-threatening, then it’s better to throw caution to the wind. You will learn much more, far more quickly, with more robustness, if you are extremely bold. Hence, delusional self-confidence [i.e. Dunning-Kruger’s “over-confident incompetents”] is the better strategy, in this type of scenario. You will not explore with a deathly fear of making “mistakes”, the delusional self-confidence will keep you trying at the task, and you will not give up out of desperation, giving yourself a better [though not perfect] chance of completing and mastering the task. With exploration may come enhanced techniques, which will further cement your mastery of a task, and fuel a cycle of confidence-begets-greater-learning-and-improvement. You DO have to have motivation at the task at hand, however. If you lose interest, that could trigger a decline in skills. So this makes sense to me. In recent weeks I felt inspired to learn how to create a woodcut. There is so much to learn, but I am enjoying every moment of this process. And by pushing through the difficult, early scary parts of learning these new skills, believing that I will master this art even as I observe my own my incompetence keeps me interested. At the end of each carving session I make a rubbing of my small progress and am challenged to a higher level.